The Mercy Sisters in Tuam town were honoured by the Tuam Town Council on the night of Monday, February 18th with a Civic Reception in advance of their departure from the town next month. 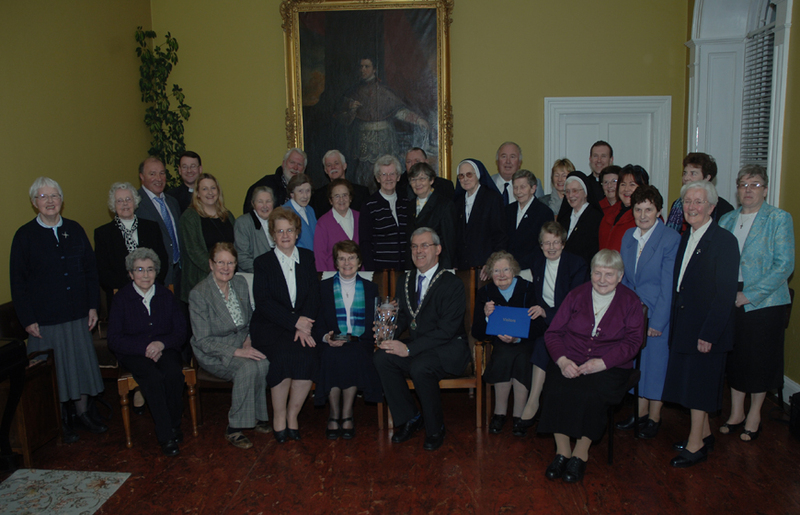 In the photo below Mayor of Tuam, Councillor Eamonn Kitt makes a presentation to Sr. Mary Walsh of the Mercy Leadership team. 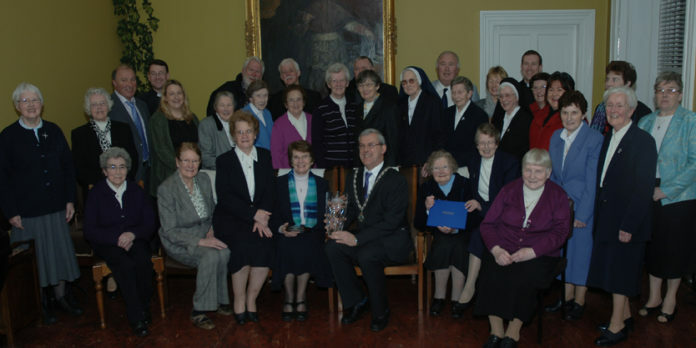 In the background of the photo is a portrait of Archbishop John MacHale who originally invited the sisters to Tuam in the middle of the 19th century. Front Row : Sisters Immaculata Ryan, Geraldine Costello, Finian Fallon, Mary Walsh (Leadership Team) Mayor Eamonn Kitt, Hilda Mannion,Geraldine Larkin, Anthony Ruane. Second Row: Anne Hynes, Assumpta Cahill, Larry Bane, Sally Ann Flanagan, Helen Scarry,Brid Caulield, Síle Lohan, Mary Hennelly, Patricia Fahy, Philip Divilly, Damian Conroy, Sebastian Dolly, Angela Holian, Imelda Kelly Anne Marie Shaughnessy, Loreto Slattery. Back Row: Fr Francis Mitchell, Pat O Hora, Tom Reilly, Martin Ward Paul O Grady, Mary Dunne, Fr Sean Cunningham Mary Corr, Teresina Daly.